The three wise men, or the three kings, are familiar figures in the Christmas tradition. Newbery medalist Linda Sue Park has taken the brief biblical references to the three as the starting point for a new story. In it we meet a boy who is learning his father's trade; a man who gathers resin from certain trees; a merchant in the marketplace; and three strangers in brightly colored robes who are shopping for a gift for a baby. 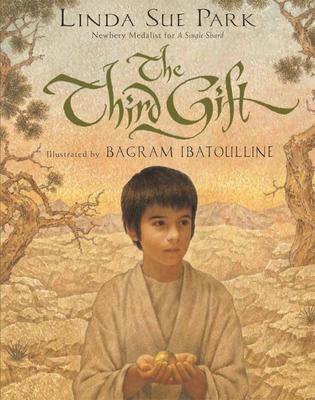 Illustrated by Bagram Ibatoulline with exquisite paintings, this simple, moving tale of ordinary people involved in an extraordinary event brings new resonance to the well-known gift list of gold, frankincense, and myrrh. Includes an author's note. Linda Sue Park is the author of historical and contemporary fiction, poetry, and picture book texts for young readers. Her third book, A Single Shard, received the 2002 Newbery Medal. Ms. Park is now one of the most prominent figures in the children's literature community and has traveled widely, both nationally and internationally, to promote her books.She is Korean American, from the Midwest; was educated at Stanford University and University College Dublin; and has worked as an advertising copywriter, a journalist, and a teacher of English as a second language. She lives in Rochester, NY, with her husband. They have two grown children. Bagram Ibatoulline was born in Omsk, Russia, and attended the State Academic Institute of Arts in Moscow. He has worked in fine arts, graphic arts, mural design, and textile design, and is adept at painting in different styles. Among the many successful children's books he has illustrated is the Newbery Medal book The Miraculous Journey of Edward Tulane. He lives in Gouldsboro, Pennsylvania.